Bill Belichick wasn't messing around against the Redskins. The undefeated New England Patriots probably don't need any help to knock off the Washington Redskins at home on Sunday. Still, in the early going, Bill Belichick is already going for the jugular. 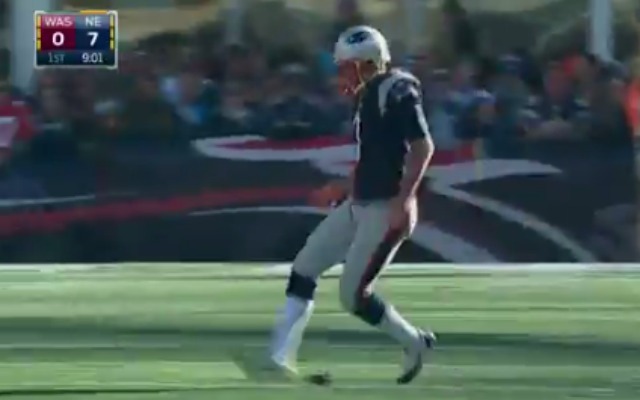 On the Patriots' opening drive, the Patriots went for it on fourth down despite being in field goal range. They ended up scoring a touchdown. Then, following the touchdown, the Patriots kept the ball for themselves. And that's because of an onside kick that caught the Redskins off guard. On second viewing, the Redskins botched that play in pretty much the worst way. One player, Ryan Grant, was completely aware of the Patriots' plans. Unfortunately, securing a bouncing football isn't the easiest task in the world. Unfortunately for the Patriots, they didn't cash in on the extra possession, as they fumbled away possession. Fortunately for the Patriots, Kirk Cousins then bounced a pass off of Pierre Garcon's head and Logan Ryan caught the deflection. The Redskins are 0-4 this season when Cousins throws a pick.